Q. How fresh is the produce? A. The pastries we supply are ALWAYS baked fresh on the morning that we deliver them. Even on a Sunday. Coffee is freshly ground and all produce is absolutely fresh - guaranteed. Q. Is the produce locally-sourced / organic ? Q. Do I need to order a set Breakfast Box? A. No. You can order any combination of pastries, jams, coffee, juices, and so on. You can also make it more luxurious by adding on Champagne, hand made chocolates, flowers, a beauty treatment or birthday cake too. If you have any other requests, just let us know - if we can, we will! Q. Can I place my order over the phone? 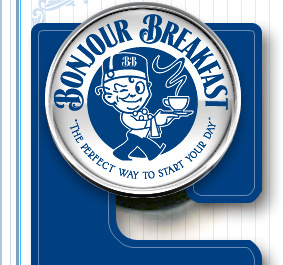 A. Bonjour Breakfast has an on-line shop so you can browse, see the products available and order directly online for ease. However, we are always happy to speak to you too! If you have questions or concerns about an order, or there is a special request then please don’t hesitate in calling us. Q. Can I place my order whenever I like? A. We have a cut off time of 12pm the day before delivery for standard items. If you have any special requests such as a birthday cake, then please give us as much notice as possible, but no later than noon on the day before you would like to receive your order. This helps to avoid disappointment. Q. Can I just phone up on the morning I want a breakfast and order it for immediate delivery? A. To avoid disappointment, you should always order in advance. As the produce is freshly made each day, we often will not have stock or delivery slots available for ad-hoc orders, but will always try to help you out if we can. If you need something the same day, please call us rather than email or place an order from the website, so that we can advise on availability. Q. I fancy a full-English! Why don't you do Bacon / Eggs / Sausage etc.? A. We knew you were going to ask that! It is something that we know people would like, and we thought long and hard about whether we could deliver a QUALITY cooked breakfast to people. As things stand, we just couldn't work out a way of getting hot breakfast to you that would still be appetising by the time it arrived. We are now supplying delicious award-winning Elles Belles organic sausages that you can cook yourself. Q. Can I set up a repeat order? Q. Do you do corporate orders / large scale catering / breakfast meeting supplies? A. Absolutely! Please give us a call to discuss your requirements. Q. Do you offer a no-quibble money back guarantee? A. Yes. If you're unhappy with any of the produce or service you receive we will endeavour to put it right. Please see our Policies page, for further details. A. Once you have placed your order in our secure online store or over the phone, you can pay by credit card (all transactions are secure), or you can select the option to pay cash on delivery.